Manage your account online, anytime using the Decore-ative Specialties Anytime® Online Account Management program. It is free, simple to use, and provides many time-saving features. Customers are able to build jobs with special modifications, use order templates for repeat orders, view pricing for their orders as they build them, and leave partially completed jobs for modification and completion at a later time if needed. The new enhanced Anytime® website expands our customer’s abilities to customize their online orders and manage their account profiles. Anytime® features will continue to improve and expand to meet our customer's growing needs. 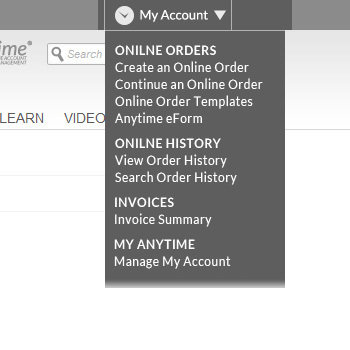 One of the many enhanced features in the new Anytime® is the ability to order products directly from the product pages. You can still place your orders from within your Anytime® Account however now it’s even easier with the new ‘Add To Order’ feature that allows you to add an item to a new or existing web order. Decore-ative Specialties offers a new feature allowing order placement using order templates. Order Templates allow customers to place orders for similar products without going through the entire order process. This feature is perfect for orders that require the same items but with different PO numbers. Choose between receiving the entire order on the same day or receiving each component at the best possible date. Additionally, different shipping methods may be selected for each order component. These options are perfect for rearranging product deliveries to suit a unique build schedule. Build the order you need with multiple door styles and materials, finishing, drawer boxes, molding, and accessories all in one order for easy viewing and tracking of your projects. Templates save order information and make it easy to place repeat orders, whether you need a template for a modification you regularly make to a door style or a complete job including sizes and quantities. Save time and increase your order accuracy with order templates. Ever forget a piece or damage something during installation? Add-on orders are quick and easy by using the Copy to Order feature. Pull up your past web order that is complete or in process and use the Copy to Order Without Lines option. Your header information for the order will be put into a new order. Just enter the new size(s) and quantities, review, and place your order. If you need special rush dates, common for Add-on items, just put your request in Special Instructions and we will do what we can to accommodate your request. View information on all your placed orders, whether they were placed online, by phone, or by fax. Online orders can be viewed in their entirety just as they were placed online and phone / fax orders can be viewed with an order summary. Review invoice details from past jobs with all your billing in one place, right at the tip of your fingertips, 24/7. Do a quick search of your orders placed online by searching the PO Number or Job Name. Each employee conducting business online can be set up with their own web user ID, linked to your account. Settings can be adjusted for each user so they can place orders, view invoices, and/or pay invoices. You know you’re safe when you send your information to Decore-ative Specialties; we use only the safest internet security provided by Symantec/VeriSign SSL encrypted certificates. Symantec Website Security Solutions include industry-leading SSL, certificate management, vulnerability assessment and malware scanning. The Norton™ Secured Seal and Symantec Seal-in-Search assure you are safe on Decrore.com. Registering your Anytime® Account is easy and comes with some great benefits like quoting your jobs online 24 hours a day, and ordering products at your convenience, day or night. Ordering products from Decore has never been easier or more convenient. Your account information will be stored in your own password protected secure account that you can edit at anytime. Click the button to the right and complete your web registration. We'll process your web registration and send you an email with your login information. Simply click the button below to get started now! Also known as an ACH transfer, ClearPay is a secure method of payment that allows Decore-ative Specialties to automatically deduct an invoiced amount from your checking account on file using EFT (Electronic Funds Transfer). Am I Required To Pay Online? No, paying invoices online is not required. You only need to check the Pay Invoices box if you wish to pay your invoices online and meet the requirements listed below. We must have a ClearPay form and voided check on file. You must have Open Account Credit Terms. Get Started With ClearPay Today! Download the ClearPay form and fax to (626) 254-6799. Decore-ative Specialties is a wholesale manufacturer of custom cabinet doors and components. We sell to cabinetmakers and contractors. We do not sell directly to the public. If you are not a cabinetmaker or contractor, please call 1-800-729-7277 or email new@decore.com and we will assist you in locating a cabinetmaker near you. If you have already chosen a cabinetmaker, please let them know which Decore-ative Specialties products you are interested in and have them contact us to make purchases for your project.